Getting a custom shirt takes a bit of extra effort — but after my successful go of it with Ratio Clothing, I wanted to see what other companies were up to. So I got in touch with Blank Label and they sent me a sample to share with all of you! I found the shirt to have a very masculine fit, so I recommend this for all masculine-of-center folk out there. The shoulders have a broadening cut, which will help minimize your chest (if you have one) and create an overall more masculine shape. Single ply 100s thread count for 85$? Woahhh. Blank Label has a pretty awesome array of fabrics and patterns — colorful, yet understated. 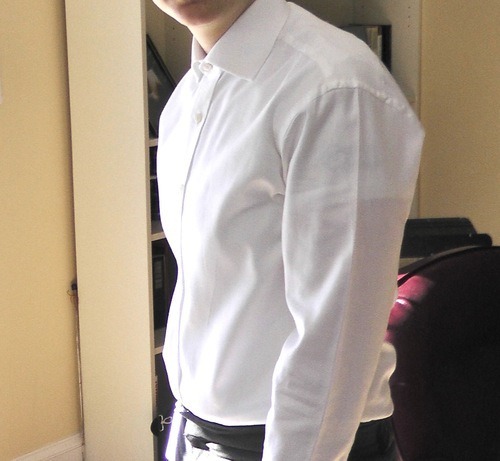 I needed a white dress shirt, so I ordered Charlie Dunst: solid white twill weave with mini point collar. The fabric quality lives goes beyond any expectations for an $85 shirt. Single ply 100s thread count; a $220 value at most tailors. The weave of the fabric is probably my favorite part about the shirt. They let you customize pretty much everything about the shirt, so you can choose from 10 collar options, none of which are too extreme for any face, and some quite unique. Why not try a club collar? You can also choose length based on whether you plan on wearing it tucked or untucked; If you plan on wearing it formally, I highly recommend the tucked option so you don’t have to worry about it coming out. If I was doing this again, I’d absolutely send them measurements of my favorite shirt rather than measurements of myself. Why? It’s easier to screw up measurements of yourself. Even if you get them taken professionally, it is still then up to Blank Label to decide how to best cut the shirt. And if you are trying to use a shirt to create a different look for your body, this can get even more complicated. Even aside from female curve issues, some people prefer a looser fit to a closer fit. Luckily, Blank Label provides a guide for measuring a shirt. It takes about 20 minutes. 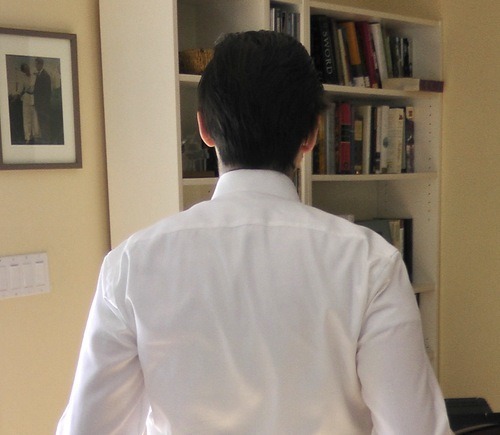 Even if you have a shirt that fits pretty well, you can guess on adjustments needed with the measurements you send. (e.g. you have a boy’s shirt that fits perfectly except for arm length.) If you fall in-between sizes, always size up. Or if you don’t mind giving up your favorite shirt for a little while and you live in the US, you can send it to them and have them measure it! Free of charge. If you would like the shirt to come out a little bit at the hips from the side seam, tell them! If you have wide hips, a bit of this can be good. It won’t look too feminine if it’s just an inch or two. Tell them you don’t want chest darts. Need more help? Email me! If you want a queer to discuss fit with before making the order, feel free to email me at sonny@qwearfashion.com and I’d be happy to help! I totally recommend them to anyone who wants a masculine shirt for a fancy occasion. Their prices and customization options are unbeatable. 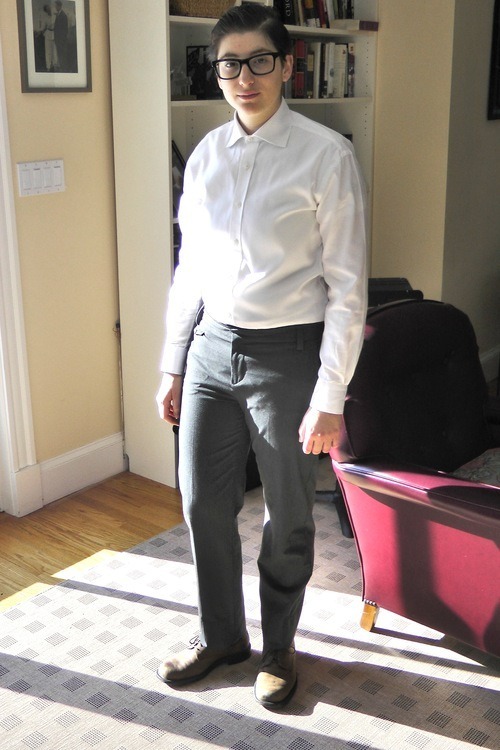 Feb 13 Androgyny: YES, I found the perfect shirt! Aug 9 Qweary: How to Wear Androgynous Button-ups and Jackets with a Large Chest?